Tungaloy have an impeccable reputation for its turning lines, something that has now been enhanced even further with the arrival of the new AH8000 insert series. Developed as part of the TungTurn line from Tungaloy, the new AH8000 Series demonstrates unsurpassed performance levels when machining heat resistant alloys. The new AH8000 Series outperforms competitor turning lines with regard to tool life and longevity, productivity and cutting performance, especially when faced with difficult machining conditions. The incredible reliability and performance is credit to the composition of the grade that incorporates newly developed substrates, enhanced adhesion strength, a Nano multi-layered AlTiN coating with a high Al content and Tungaloys exclusive PremiumTec Special Surface Technology. What all this means for the customer is an insert grade that is at least 20% harder than alternate grades, a feature that prevents the development of micro-cracking and premature tool failure. With stable and extended tool life guaranteed, the bonding of the substrate prevents notch wear and further extends performance parameters when machining heat resistant alloys. Under test conditions on a variety of inconel, titanium and alternate aerospace grade alloys, the Tungaloy AH8000 has more than quadrupled tool life whilst drastically reducing machining times. These astounding performance characteristics are a combination of the AH8000 grade composition and the extensive range of innovative geometries and chip breakers that are available. Within the AH8000 Series is the AH8005 grade for continuous machining at higher spindle speeds and the AH8015 grade that is extremely hard and durable for interrupted cutting applications. As well as the two grade options, Tungaloy has developed its HRM chip breaker designation for finish to medium cutting whilst the HRF breaker is the premium choice for finish turning operations. 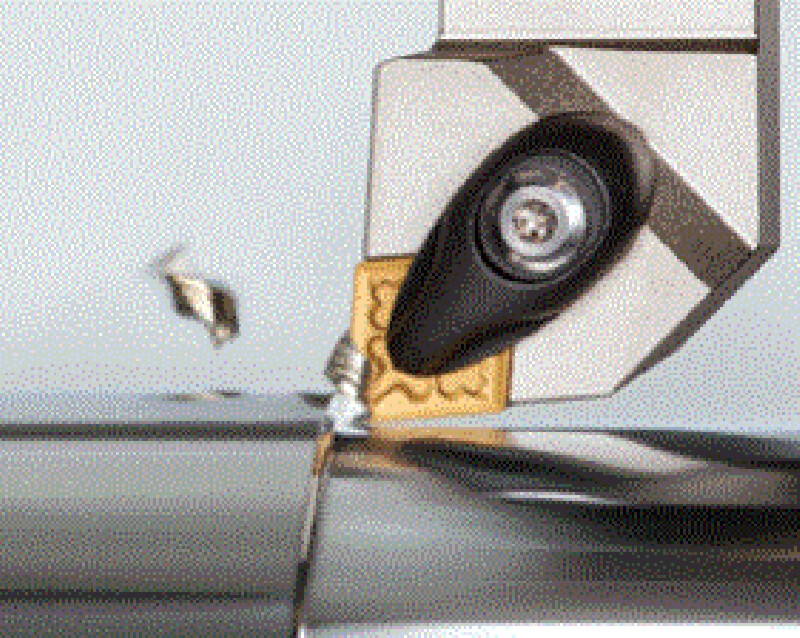 The HRM chip breaker has rake face protrusions and an optimised rake face geometry that combine to reduce contact between the tool and workpiece as well as generating low cutting forces and stabilising chip control. Adding to these negative insert chipbreakers, Tungaloy has now developed a positive insert line with new PSF, PSS and PS chip breakers. This impressive new turning series is available for a vast range of applications with an extremely diverse line of insert shapes and sizes available to suit most Tungaloy turning tool holders. The diversity of the AH8000 Series includes a 35, 55 and 80 degree Rhombic insert, a square, triangular and trigon insert (90, 60 and 80 degree) designation as well as a round insert range. If you wish to improve your turning performance and tool life on heat resistant alloys, please contact Tungaloy UK.